I have stumbled upon yet another wonderful etsy seller, Stella Bluz, specialising in vintage clothing, and products. Audrey, of Stella Bluz, agreed to participate in Recycled Fashion's About My Shop blog feature. About My Shop gives sellers specialising in vintage, second hand and upcycled fashion, a chance to introduce themselves, their garments, and stores to Recycled Fashion blog readers. What is your shop/online store called and what do you sell? The shop is called Stellabluz after my first born daughter and an awesome Jerry Garcia song~ It contains a lyrics that croons, "Dust off those rusty strings, just one more time...going to make them shine..." So I thought a great name for a shop that promotes re-found, re-loved and re-cycled vintage clothing and goods! I carry mostly adult clothing, with some treasured baby and childrens vintage threads as well as some household decor and vintage oddities. I have been collecting vintage clothing since I was 13. My mama saved a lot of her 1960's-70's clothing and passed them on to me. Thus creating my style and affection for clothes and music of that era. I started scouring thrift stores and estate sales in hopes of finding magical woven treasures to adorn my inspiring youthful days! When did you start trading? Since 2000 I have officially traded my collection, first on the road with vagabonds and a band. My moving store was called "Psychedelphia" and I was proud to be one of the only vintage sellers on the lot. It was great to sell dresses and skirts to girls and then see them donning their bright paisley layers that night at the show. I came to Etsy in 2007 and it has been a wonderful place to sell and be! Are there any particular products in your store that are most popular? In the etsy shop there is a wide variety of styles and eras. I try to gather as many different textures, styles, eras and colors that might appeal to each awesome individual vintage dresser. People are so unique and beautiful in each individual way so I try to reflect that in the things I collect. AND offer them to all at an affordable and realistic price. Popular items are probably the 1960s-70s era skirts and dresses~things with lots of bold color and things that are of modern day size! So many awesome finds are so small in size and so things that fit an average sized gal today tend to be quick to sell! Would you like to show us some of the products you currently have for sale? 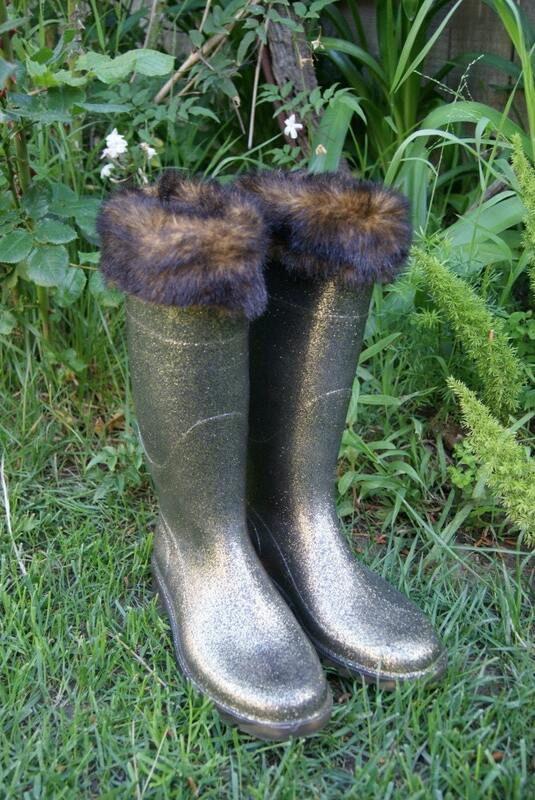 I have some favorites in the store currently~The Italian Glitter rain boots are so sweet. I love the carpet coat in mossy greens and pinks, the suede fringed poncho and of course all the bombshell bathing suits! What is the future of Stella Bluz? The future of the shop expands every week as I usually shop locally continuously. My listings may slow a bit as I am expecting my third babe in July, but I love to be able to sell and support my family from home in anyway I can! Etsy is an awesome source to be able to do so. Where can we find your store? Thank you Audrey, and all the best to you and your growing family!